Nicola Sturgeon has been included in a list of the leading global thinkers of 2016 alongside the likes of Mark Zuckerberg and Ban Ki-Moon. The list, compiled by respected global affairs magazine Foreign Policy, includes the First Minister of Scotland ‘for weathering Brexit’. The description reads: “As UK politicians pushed for a Brexit vote, Nicola Sturgeon advocated for Scots to remain in the European Union. Her nation heeded her call: 62 per cent voted against leaving. The magazine goes onto highlight the ‘listening exercise’ that Ms Sturgeon and her party undertook to gauge public opinion on a second referendum. 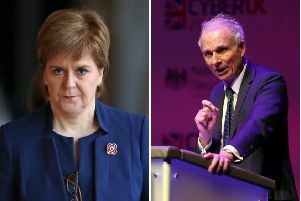 The SNP leader is named alongside figures such as Canadian Prime Minister Justin Trudeau, Democratic presidential nominee Hillary Clinton and outgoing UN Secretary General Ban Ki-Moon. Ms Sturgeon is one of only two UK-based politician to be included in Foreign Policy’s leading global thinkers. Other notable inclusions are Facebook founder and philanthropist Mark Zuckerberg and his wife, the physician Priscilla Chan; Northern Irish abortion activists Colette Devlin, Diana King and Kitty O’Kane - ‘for committing a righteous crime’ - as well as German chancellor Angela Merkel and US Attorney General Loretta Lynch. Taiwan’s president Tsai Ing-Wen is included her work on making the island’s sovereignty a priority, along with Indonesian leader President Joko Widodo, for ‘forging a shaky path towards historical reckoning’.